At Luna Vision Dr. Dutt has done thousands of LASIK procedures and will personally do your evaluation, your procedure, and post operative care. We have a Technolas laser with a 3d eye tracker. The LASIK procedure takes about 10 minutes and is painless for each eye and you are expected to drive without glasses the next day. LASIK corrects both nearsightedness, farsightedness and astigmatism. Our procedures are as low as $999.00 per eye which includes all of your visits up to a year. The LASIK procedure is done in our Greensburg office conveniently located off of the turnpike. However we can also follow you up and do evaluations at our Pittsburgh Mills location off of Route 28. Please call 724-224-4800 for a consultation with a 25.00 deposit. We look forward to seeing you for a consultation. LASIK is a safe and effective FDA approved procedure to eliminate dependence on glasses and contacts. It is used for nearsightedness, farsightedness and astigmatism. LASIK can also be performed for those who need reading glasses. 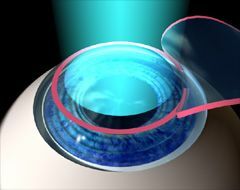 During a LASIK procedure, a CO2 laser is used to reshape the cornea much like a contact lens. The laser has an eyetracker that follows your eye within a millionth of a second and automatically corrects your prescription. For patients treated with basic LASIK 99% are 20/40 or better and 86% are 20/20. Additionally, patients choosing a custom wavefront LASIK procedure - using advanced NASA technology - have 20/20 results 99% of the time. The procedure takes five minutes for both eyes. You can drive the next day without your glasses. Also, ask about our total bladeless technique, called Intralase. We welcome you to our practice and provide you our instructions while we prepare you eyes for the procedure. During that time you will receive a mild sedative to calm the nerves. The procedure is performed with numbing drops thereafter. 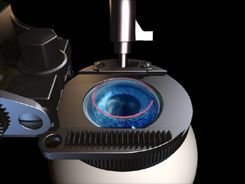 First, a circular ring is centered on the cornea and held in place via vacuum. The vacuum causes a pressure sensation and temporarily dims the vision. In order to help confirm proper vacuum, many surgeons will pause to ask the patient whether the vision is dark and a pressure sensation is present. 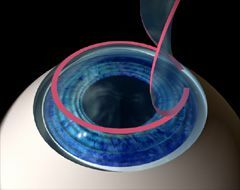 Once adequate vacuum is achieved, the microkeratome is attached to the ring and passed across the surface of the cornea to create the flap. Because the vision is dark, this step is not visible to the patient. After the microkeratome pass, the vacuum is released, the circular ring is removed and the flap is lifted to expose the stromal bed. Lifting of the LASIK flap. The laser treatment usually lasts anywhere from a few seconds up to a minute, depending on the amount of correction. Afterwards, the treated area is rinsed and the flap is smoothed back into place, where natural adhesive forces seal it down. The LASIK flap is now back in place. 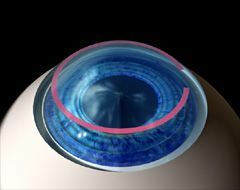 With IntraLASIK, also known as "All-laser LASIK", a corneal flap is created with a laser manufactured by Intralase Inc. and the laser treatment is placed on the exposed stromal layer. 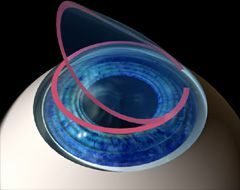 As with standard LASIK, a circular ring is centered on the cornea and held in place via vacuum. The vacuum causes a pressure sensation and temporarily dims the vision. At the bottom of the cone is a glass plate that rests on the cornea. 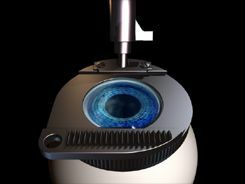 While looking through the surgical microscope, the surgeon is able to see the eye through the glass plate. The docking process is complete and the cone's glass plate rests on the corneal surface. A laser pulse strikes the stromal layer. The surgeon's view of an Intralase laser creating a corneal flap. The Intralase laser focuses tiny pulses of energy in the stromal layer beneath the corneal surface. By placing thousands of spots very close together, a plane of separation is created. The pulses are then stacked along the edge of the flap up to the corneal surface to complete the flap. Each pulse of the Intralase laser creates a small bubble of water vapor and carbon dioxide in a process known as photodisruption. The bubbles appear to the surgeon as an area of slight opacification. Some surgeons lift the flap and perform the vision correction laser treatment just as soon as the Intralase laser finishes making the flap, while others pause for 10-15 minutes to allow the bubble layer to dissipate. 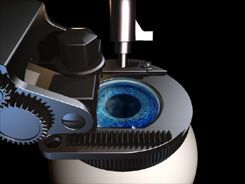 After the flap is lifted, IntraLASIK proceeds just like standard LASIK. The laser treatment is placed on the exposed stromal bed, the treated area is rinsed and the flap is smoothed back into place.